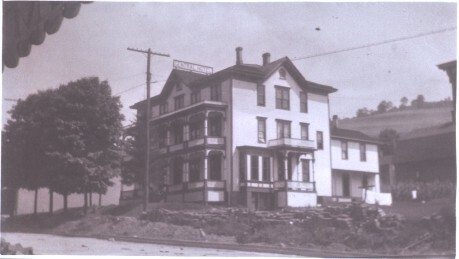 The first Central Hotel was built in July 1878 by R. Dennis. This structure burned on August 14, 1880. 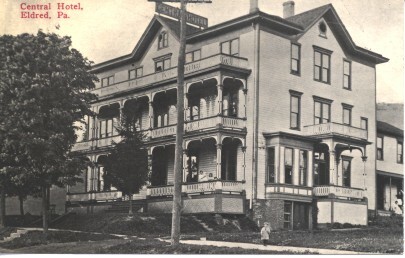 The pictured hotel was built and reopened on January 19,1881. Collins & Bedeaux, Proprietors in 1903. 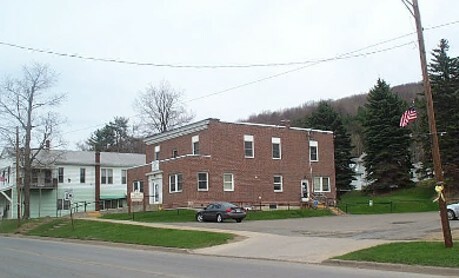 A large and dominating structure on the upper side of North Main Street between Central and King Streets. This was also the location of the IOOF (Independent Order of Odd-Fellows). In December 1931, the hotel burned and might have resulted in greater loss of buildings, had the firemen not been well equipped to fight the fierce blaze. Even then, several buildings were in grave danger (including my house) for a time, as the large building burned rapidly and threw an intense heat on other buildings in the vicinity. The Central Hotel in 1916 during the paving of Main Street.